One thing is certain: none of the pundits predicted the victory of Donald Trump. So was Hilary Clinton and her supporters. They thought, even as the results were beginning to be tabulated, that they would win. But this was a repeat performance. And the result has produced the biggest political upset in recent US history. Trump has never held any public office. He has not been elected anywhere. He has no government experience at all. But a politically unencumbered Donald Trump also has the opportunities to make history. It is much to easy to dismiss Trump’s supporters, as Hillary Clinton did, as being “deplorables” as she called Trump’s noisy and boisterous crowds, in one of her less felicitous observations. And especially to dismiss those who turned out in absolutely record numbers to support him on Election Day as all being older white men, all of them backwoods racially and ethnically prejudiced neo-nationalist extremists. In fact, even 30% of Latinos, seen by the pundits as being overwhelmingly for Hillary Clinton, voted for Donald Trump. And although Clinton won in 31 of 35 cities, Trump won statewide in Florida, Ohio, North Carolina, Pennsylvania, and in Wisconsin. He even won in Utah where the pundits had predicted that the large Mormon population would reject him. It is true that his supporters included a wide range of people dissatisfied and angry with the metropolitan and globalized elites which have dominated both political parties. Hillary Clinton was seen as representing the political status quo. As indeed she did. And the wiki leaks revelations of the apparently shady dealings of the Clinton foundation, where Bill (And Hillary) had gained mighty fees for speeches (including from the Brazilian banco Itaú) which had more to do with gaining influence, than for the content of the Clintons discourse, as well as the saga of the congressional and FBI on-and-off investigation of her use of a private email server while she served as President Obama’s Secretary of State, did not help. But above all she missed the growing consternation and alienation of the majority of citizens. This included many disenfranchised white former unionized working class men, displaced by the loss of formerly well paying manufacturing jobs throughout the upper mid-western states, who have seen, over the past two decades, their factories closed, and their jobs lost to Mexico and China. And this sullen anger was powerfully reflected by Trump’s anti-free-trade rhetoric, and his constant attack on NAFTA, which had been one of president Bill Clinton’s principal, and much touted trade deals, and which many who live in the so-called “rust-belt” communities, blame for the demise of their livelihoods. In the distant past in Europe what happens this week in the United States would have been called a “peasants revolt”. Today it is a revolt at the ballot box. But no-one should underestimate what has just happened. Both in the UK over Brexit, and now in the USA, President-elect Donald Trump has, in his own inducible and often tough style, taken advantage of a wave of neo-populist revulsion with the political and economic establishment, especially that located in cosmopolitan New York City and Washington DC. 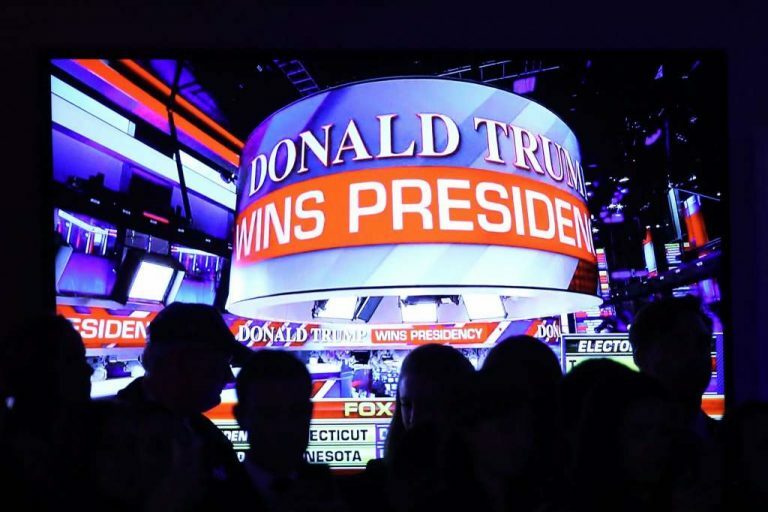 This allowed him to gain an overwhelming electoral victory, which will without question, not only transform American politics for decades to come, but which will also potentially bring about profound changes in US relations with the rest of the world. Trump’s victory also saw the Republican Party retain control of the US House of Representatives and the US senate. And they did so very much as a result of Trump’s electoral coattails. This will mean what speaker Paul Ryan calls a “republican” government, where the two houses of congress and the presidency are all held by the same political party. This will have enormously important implications for future legislation, and above all for the future composition of the Supreme Court, where the appointment of a new justice is pending to fill the vacancy left by the death of justice Antonin Scalia, and where more vacancies are likely to be occur over the next few years. So that the other major branch of the US government structure, the Supreme Court, is also impacted by Trump’s victory. What else will Trump do? On the domestic front, Trump has promised to do away with “Obamacare” which was President Obama’s singular legislative achievement, but which is deeply unpopular among voters, and which faces major rises in the cost of premiums next year. He has said he will reverse all of Obama’s executive orders which is within his presidential power to do. He will impose limitations on the access of Muslims to the US. Not surprisingly the Mexico peso, which has yo-yoed up and down as Trump’s fortunes waxed and waned in the opinion polls, has suffered its greatest collapse in its value against the US dollar since Trump’s electoral victory. Trump he has said will repudiate and renegotiate trade deals in the interests of protecting American jobs and national interests. It is a potentially revolutionary agenda. Not surprisingly Trump’s electoral victory has been greeted with dismay in many international capitals from Berlin to Brussels to Mexico City. In Moscow, meanwhile, the reaction to Trump’s unexpected victory was all delight. Trump is seen by Vladimir Putin (unlike Hillary Clinton) as being a much more workmanlike partner in improving US-Russian relations. But the test may come much sooner than Trump wants. The Russian battle fleet is already assembled on the Syrian coast. Putin with his ally President Assad will undoubtedly strike the rebel areas of Aleppo before President Trump assumes office in January. Putin is famously skillful at creating “facts on the ground.” He has done so in the past and there is no reason to believe he will not do so again while the U.S. is preoccupied with a totally unexpected and unprecedented presidential succession. So there is much to worry about. An untested American president is arriving in a very dangerous world. The domestic agenda will upend much of the consensus of recent decades. And a formidable potential challenge to international business, financial and policy elites, which have in Trump’ s worldview, have stacked the cards against the average American worker. The world will not be the same under president Trump. Editor’s Note: We have consistently taken Donald Trump and his candidacy seriously. That puts is in a distinct minority. Now the press which could not do anything but support the political mobilization of his critics and opponents and the Inside the Beltway strategists are now going to get it right about Trump and his Administration’s path to the future? In our next Forum to be launched shortly, we are going to address the challenges and the way ahead for Trump and his Administration in defense and foreign policy. He comes to power when first order principles worldwide are in turmoil; he is prepared to look at first principles and to shape new paths and approaches. We have been the first to the Whiteboard in taking Trump seriously PRIOR to him becoming the President-elect. We will continue to do so and to be more than willing to criticize those in the “policy elite” who believe their outmoded views simply prevail over the new President, his Administration and the American people.